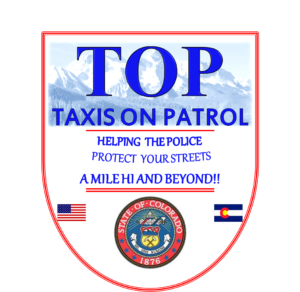 We are proud to be the Founder of the Colorado Taxis-On-Patrol (TOP) program. A public-private partnership designed as an anti-crime and emergency reporting program whereby trained volunteer drivers, in the performance of their duties, serve as additional eyes and ears for law enforcement agencies in reporting observed crimes, suspicious activity, fires, automobile accidents, medical emergencies, and the like. Metro Transportation wants to ensure the safety of our passengers. It’s impossible for law enforcement to be everywhere at all times. Annually, countless crimes are committed that are virtually unsolvable simply because law enforcement officers are unable to travel to the scene of the crime before the perpetrator can get away. It’s a problem that has affected big cities for centuries, but Metro Taxi and the Taxis on Patrol (TOPS) program is hoping to change all of that by alerting law enforcement officers of crimes around the city whenever they spot them. Metro Taxi adopted the TOPS program in 2011, and less than 24-hours after implementing TOPS, the program paid off. One Metro Taxi driver saw a pickup truck sideswipe another vehicle outside of a nightclub, killing a valet driver as a result. The taxi driver then followed the truck, wrote down the license plate number, and contacted the police. As a result, police found one of the criminals linked to the hit-and-run and arrested him. Because of the Metro Taxi driver’s heroic actions, this actually led to ‘The Medina Alert’ (named after the valet that was killed). A voluntary partnership between other agencies (including TOPS) aimed to report hit-and-run cases, it was signed into law as The Medina Alert Hit-and-Run Bill in Colorado by Governor John Hickenlooper on March 25, 2014. Without question, this life-saving law would have never existed without Metro Taxi and TOPS.